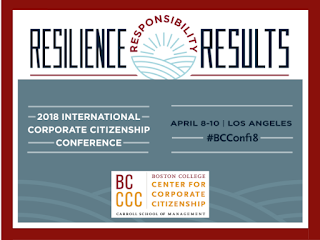 The International Coporate Citizensship Conference, subtitled Resilience, Responsibility and Results will take place on April 8th 2018 in Los Angeles, California. 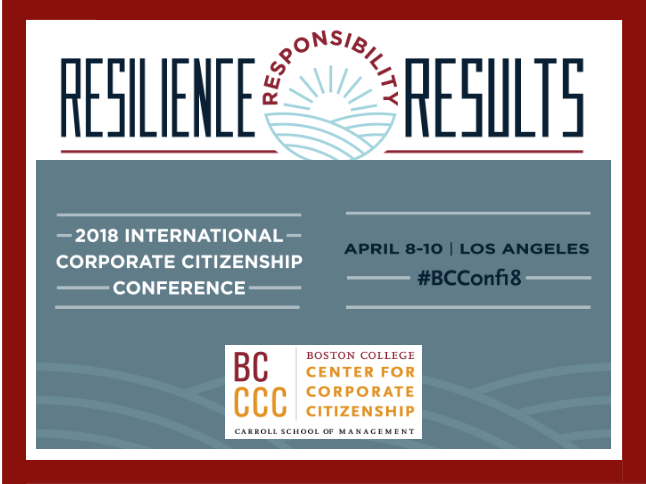 At this conference, the Boston College Center for Corporate Citizenship will explore how strong corporate social responsibility programs can ensure a sustainable and prosperous future while delivering strong returns. This is the best place to connect and network with “who’s who” in the field. Leading companies are demonstrating resilience and corporate responsibility to achieve results. They are advocating for environmental, social, and governance action at an unprecedented scale—and in doing so are investing now in what will make them stronger later. Join more than 600 CSR leaders to explore how strong corporate social responsibility programs can ensure a sustainable and prosperous future while delivering strong returns now. Learn how you can create proactive programs, align your efforts with business strategy, make the most of the opportunities presented by diverse and engaged stakeholders, and build flexibility into your work—so that you can deliver business and social value now and in the future.